Month trip in new van starts…. – Do your dream! OK, so after a fair few test nights, its time to use the tiny campervan for a month long trip. And not just a trip, but one that required loads of kit. It’s a standard month in France, bumbling to the Alps, doing some downhill mountain biking and walking, then down to the gorges in Verdon and surrounding area, rivers, lakes, and down to the Med beaches before bumbling home. 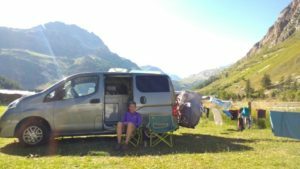 Wild camping and using Aires where possible, and select campsites where we want to. So we need lots of stuff! Camping chairs, BBQ, awning for when we hit the sites, bikes, helmets, bike spares, knee/shin pads, mountain clothes, beach clothes, and everything in-between and lots of food and goodies from the UK. Not quite sure what we weigh, but we don’t appear to hit suspension stops on normal driving (only over vicious speed bumps). Anyway, set off, and ferry was delayed due to bad weather, so Mel started worrying, but in the event the sea was very calm indeed and the crossing to Caen was fine, just dull. Then just an hours drive to Falais where we wild camped outside the castle (seems to be permitted). 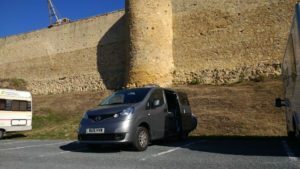 Next day, a drive avoiding motorways to Gien which looked nice enough to stop in (free aire). We got there early enough for a run along the Loire and planned to go for a swim afte in the outdoor pool, but I was rejected due to my swimming shorts being too long! I offered to go in naked but that was also refused, think the receptionist was a grumpy cow on a bad day. So soaking in sweat we tried the new solar shower and just got away with it, and then hit town for a beer. On that note, so far we’re astounded how expensive things are here – and that’s before the exchange rate is taken into account. Hopefully things will change. After another days drive we stopped somewhere else, forget where and no great loss (!) – it was nice enough, but nothing special. 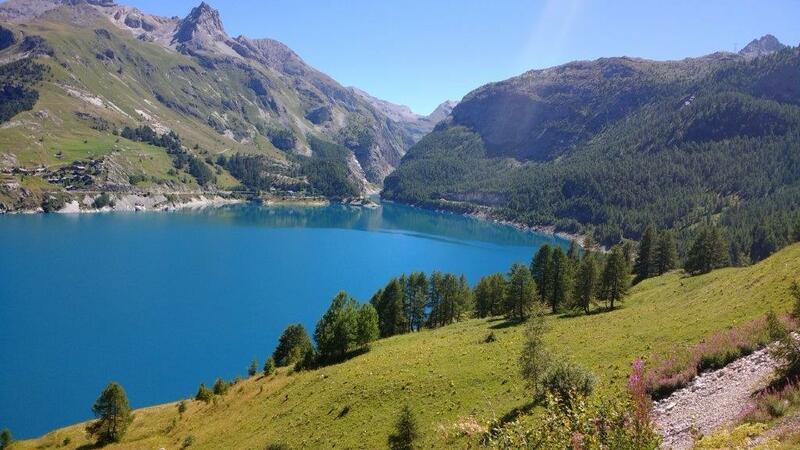 And by now, we just wanted to get to the Alps – first stop Tignes. So we got there fine, and stayed in the aire for the first night (bit meh) but overall the place was ok. Bit too resort like for us, but reasonable. The free ski lift for us and the bikes was good, meaning the first day we did quite a few runs trying to remember how to do it – and as usual we were under-kitted compared to most. However, we remembered and did reasonably well on the greens (which aren’t THAT easy). Quite challenging in places. 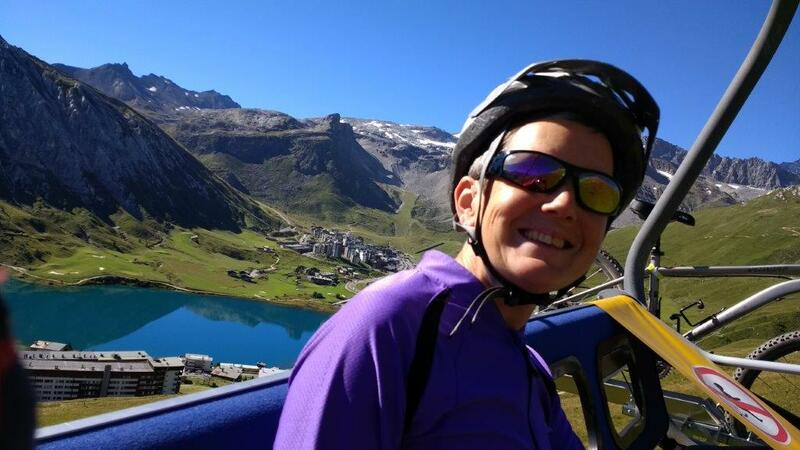 We also did some bits of blue, and I did a long blue back which Mel wimped out on, which was fair enough as she just had a major off – an amazing flight over the handlebars onto the ground, then bounced and summersaulted over a massive rock, and landed in a perfect roll. I was at the bottom and watched all happen but nothing I could do beyond repair the bike after, and wipe up the blood. Surprisingly, Mel bounced well with only minor blood loss and some new bruises which considering was quite astounding. Its also annoying as we were enjoying the blue and missed a sign and went down the red bit which caught us by surprise – hence the off. Anyway, we then (as planned) moved to Val d’isere which is linked and has some very long runs for some good practice. 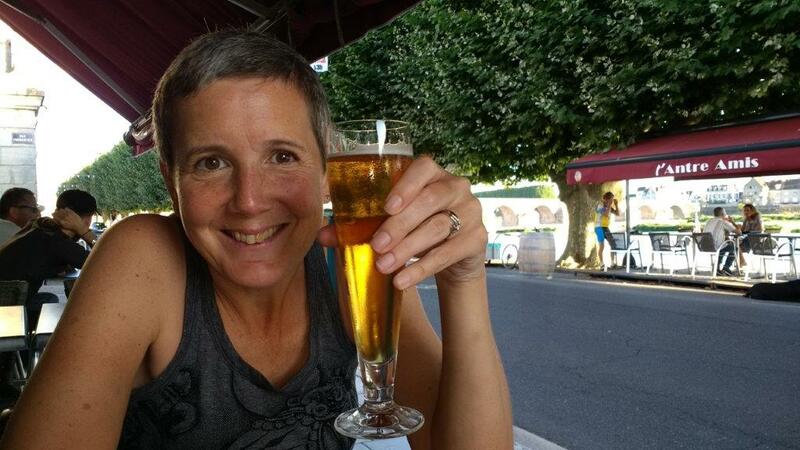 So bumbled to the campsite there for our 5th and 6th nights and did the washing and let Mel recover! (All fine really, though bruises getting bigger and more colourful!). Pingback: The Alps, and The Verdon – Do Your Dream!! 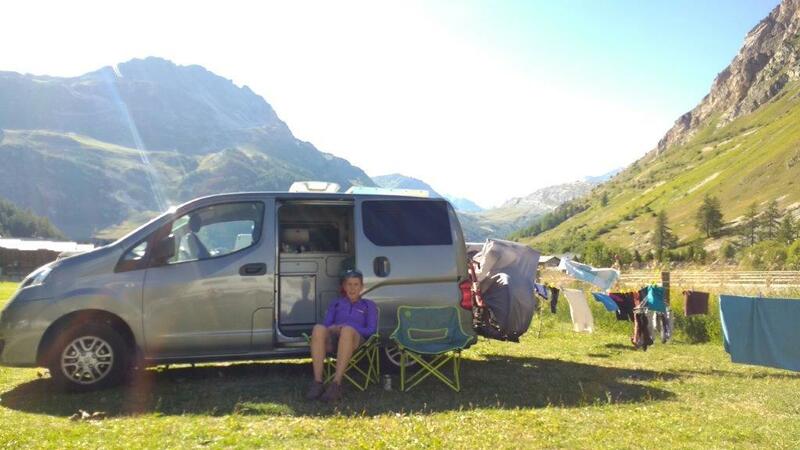 Pingback: How did the NV200 campervan do? – Do Your Dream! !